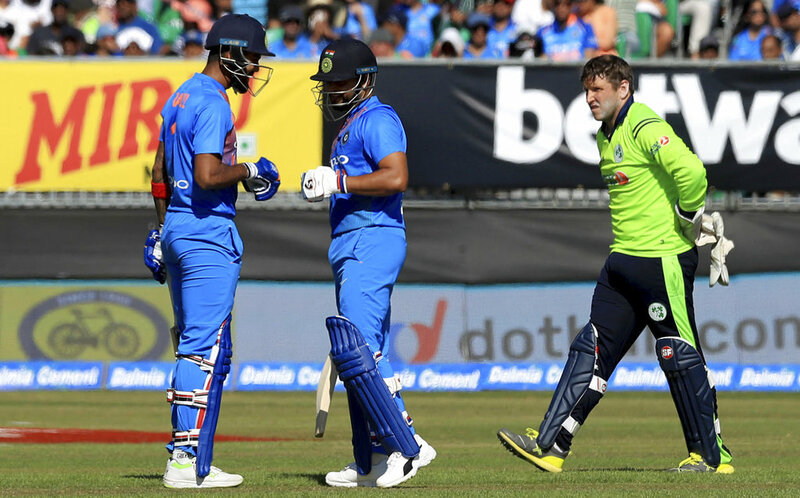 India rode brilliant half centuries from Lokesh Rahul and Suresh Raina, and an explosive cameo from Hardik Pandya to post a massive 213/4 against Ireland in the second and final T20 International here on Friday. Coming back to the side after missing Wednesday’s opener, Rahul grabbed his chance with both hands, striking a quickfire 36-ball 70, comprising three fours and six sixes to set the tone with a 102-run second wicket stand with veteran Raina, who also made the most of his chance with a 45-ball 69, including five fours and three sixes. Pandya (32 off 9 balls; 4×1, 6×4) then applied the finishing touches to the innings, milking 39 runs off the final two overs to push India’s total past the 200 run mark for the second consecutive time. Already 1-0 up in the two-match T20I series, the visitors tested their bench, making four changes to the playing XI which also saw a change in the batting order. Put into bat, India overcame the early loss of skipper Virat Kohli (9), thanks to a positive approach by the left-right combination of Raina and Rahul. Kohli’s ploy of promoting himself to open the batting did not materialise as the right-hander once again fell to pacer Peter Chase’s short delivery, comfortably latched on by George Dockrell at deep square leg. Kohli’s dismissal brought in Raina, who started off in vintage fashion welcoming medium pacer Stuart Thompson for two massive sixes before settling down as India raced off to 50 in just five overs. Rahul, on the other hand took on the off-spinner Simi Singh, clobbering him for two sixes and a boundary before sending Boyd Rankin to the cleaners en-route his 26-ball half century even as India reached the 100-run mark midway through the innings. With the visitors comfortably placed at 128/1, Rahul and Raina continued their dominance over the bowlers until veteran Kevin O’ Brien managed to break the partnership with the wicket of the right-hander off his very first ball. One ball later, O’ Brien struck again with the wicket of new man Rohit Sharma for a duck which brought Manish Pandey (21 off 20; 4×1) to the middle. The right-hander played a steady knock even as Raina continued his belligerence at the other end to bring up his fifth T20I half century before quickly falling prey to O’ Brien’s slower delivery in the 18th over. The departure of Raina brought in the dangerous Pandya, who found the stage perfect to launch an all-out attack on the Irish bowlers, which saw India’s total swelling over the 200-run mark. Brief Scores: India 213/4 (Lokesh Rahul 70, Suresh Raina 69, Hardik Pandya 32 not out; Kevin O Brien 3/40) vs Ireland.